Pickering, Ont., native Eric Wood was the first Canadian selected in the 2012 MLB First-Year Player Draft. Photo courtesy of Baseball Canada. OTTAWA – Eric Wood (Pickering, ON) became the first Canadian selected in the 2012 MLB First-Year Player Draft when the Pittsburgh Pirates took him in the sixth round, 196th overall. In total, nine Canadians were selected on day two of MLB’s First-Year Player Draft which saw rounds two through 15 completed. The draft will conclude on Wednesday beginning at noon EST for rounds 16 to 40. 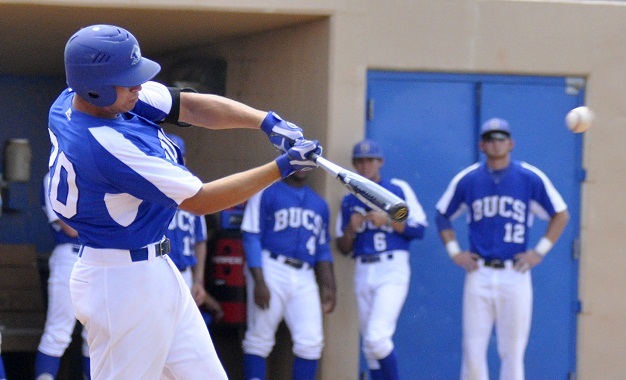 Wood played this spring at Blinn Junior College in Brenham, Texas where he hit four homers and knocked in 39 runs in 53 games, while playing third base. This is the second consecutive year that Wood has been selected in the MLB First-Year Player Draft. The Oakland A’s made him their 37th round selection (1125th overall) in 2011. Left-handed pitcher David Otterman (Coquitlam, B.C.) was the next Canadian off the board. The University of British Columbia student went to the Milwaukee Brewers in the seventh round, 245th overall. A trio of Junior National Team (JNT) grads were the next to go as catcher Rowan Wick (Vancouver, B.C. ), who attended Cypress Junior College, went to the St. Louis Cardinals in the ninth round, 300th overall. Right-hander Jeff Gibbs (East York, ON), a University of Maine attendee, went three picks later to the Arizona Diamondbacks and infielder Maxx Tissenbaum, a Stony Brook University student, landed with the San Diego Padres in the 11th round, 345th overall. Third baseman Johnny Caputo (Toronto, ON) became the first current member of the Junior National Team to be taken, as the Oakland A’s made him their 12th round pick, 379th overall. Left-hander Ryan Kellogg (Whitby, ON) was then selected by the Toronto Blue Jays six picks later, while Dayton Dawe (London, ON) became the third member of the JNT to be drafted, when the Yankees chose him in the 15th round. Tyler Hollick (Calgary, AB), an outfielder from Chandler-Gilbert College, was selected in the 14th round, 448th overall by the San Francisco Giants. Follow Baseball Canada on Twitter (www.twitter.com/baseballcanada) as they will post all Canadian draft selections on day three as they are made available. A bit of a down year for # of Canadians drafted, but who knows, in 5 years it could be our best draft ever! 2002-Loewen, Francis, Votto, Crain etc…..was darn good.